I love spending my days helping our patients achieve a healthy, beautiful smile. Everyone on our team is committed to providing great care and making sure each person has a positive experience at every visit. We all enjoy getting to know our patients and becoming friends with them while we help them develop a healthy mouth. I work in both our front and back offices. In the front, I’m a receptionist who welcomes patients when they arrive, answers the phones, and helps to coordinate treatment planning. 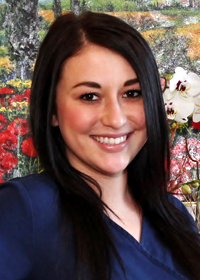 As a dental assistant in the back office, I provide chairside support to our doctors and patients during procedures. I am a hardworking mother of one. In my free time, I love being with my family and friends, especially when we’re enjoying outdoor activities. It’s a joy to come to work each morning. I look forward to talking with and helping our patients. I like becoming friends with them, learning about their lives and interests, and sharing stories. Each person has specific reasons for coming to us for care, and it’s always my goal to make sure they are smiling when they’re finished with their visit, because they’ve had a good time while here. 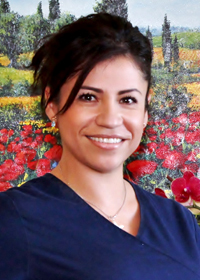 As a dental assistant, I work chairside with our doctors as they perform dental procedures. I support the doctor and the patient, to make sure the patient is comfortable. I really enjoy working in the dental field and find it rewarding to help people reach and keep great oral health. In fact, I’m planning on becoming a dental hygienist in the near future! I arrive at work smiling, because I know my day will be spent making a difference in the lives of our patients, and I end the day smiling, because my work is fulfilling. 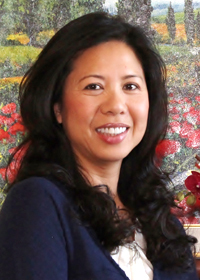 I like helping patients who have varied needs and considerations that must be addressed. It’s a good feeling to make sure each visit is a pleasant one, and knowing I’ve done everything I can to ensure the patient has had a good time while in our care. 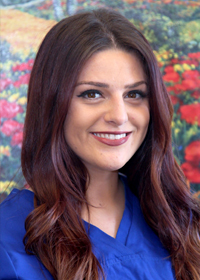 As a dental assistant with expanded functions, I work with our doctors to help our patients achieve optimal oral wellness. I’ve lived in Santa Clarita since 2001 and love the area. I’m happy whether I’m out walking, swimming, enjoying the mountains, or kayaking in the Ventura Keys. I’m recently married and have two children. It’s very important to me that each patient has a great visit, every time. I’ll go the extra mile to make sure a patient is comfortable and relaxed during their visit, and so will the rest of the team members. We’re all passionate about patient care and making sure each person’s happy with everything that happens while they’re with us. 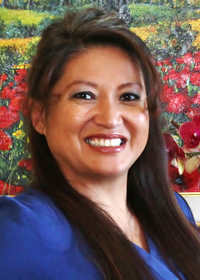 I am a receptionist who can be found at the front desk, greeting patients as they come through the doors, helping with paperwork, and scheduling appointments. I’m also a dental assistant, working in the back with our doctors and patients. Before I became a dental assistant, Dr. Thai was my dentist. In fact, he still is! In my free time, I love being with my family, exploring and enjoying the great outdoors. I earned my BS degree in Accounting from Cal State-Northridge, and have been with Bouquet Smile Dental since the first day our office opened. My main duties include all administrative business for the practice and our patients, and making sure the office runs smoothly from day to day. Since joining our team, I’ve gotten to know many of our patients quite well. I enjoy coming to work every day because of the relationships I have created with them and with the rest of my team. I am so proud to be a part of such a wonderful practice.